I really like the idea behind this game. Music & graphics are very fitting. As for controls, I wish the character would keep walking when holding the key (my poor keyboard ^^). The puzzles self tend to be quite tricky. I like the idea a lot. And the music and atmosphere are both great. But why does darkness explode out of the player character every time they walk? It obscures the map and confuses me more than anything. Also, what does the orange thing do? Is it the source of your "puzzle powers"? I also can't walk more than one square by holding down the WASD/Arrow Keys. A little thing, but especially for a game based on traversal, it's something to consider. The first puzzle is fine; I had to steal a puzzle piece from the second puzzle to solve it, though. The second puzzle kinda amps it up, though, I think. First puzzle = puzzle pieces with unmovable blocks. Second puzzle = much more freestyle. Those are two very different things that needs to glide into each other, especially in the early puzzles. I assumed that for the second puzzle you needed the other puzzle pieces too, so I brought them over. Turns out you were trying to teach me how to use a few blocks to make a few steps at a time. This was pretty unclear, especially since the first puzzle was still in sight of this one, and the area of this puzzle looked very open--I assumed you would need all the pieces to make a big bridge. For the second puzzle, I'm having trouble finding out how to cross to the pieces that don't have edges pointing out (like ]] not ][ ). The three green pieces I have don't work--maybe I need the pieces from the first puzzle after all? I'm starting to wonder if the game's bugged or has a problem in this level. None of my pieces work. Or maybe I'm just not seeing it; please let me know. I also wish you could turn the puzzle pieces, maybe with right click. And the fact that you can't move other puzzle pieces while standing on puzzle platforms really boggles me. That would open up a lot of possibilities. 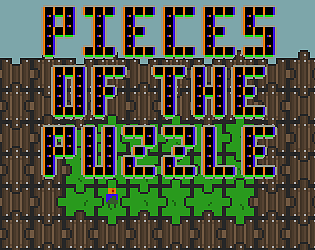 The game needs to take enough advantage of the "puzzle piece" part of the it; you should expand on it in the future. All in all, a neat concept. Consider making a full version of this when the jam's over. Thanks for trying the game out, it is a bit of a rushed mess. 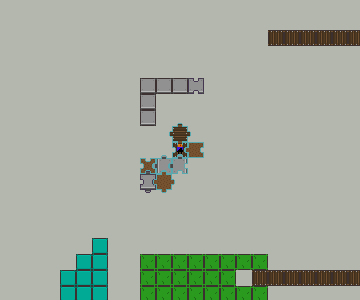 The blocks with flat edges are intended to line up with flat tiles, allowing you to reach places that don't have connections. 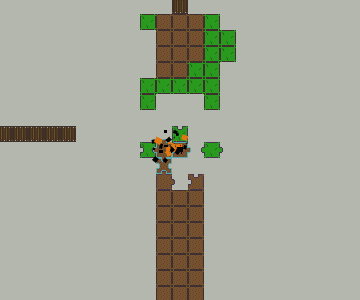 As for the orange block, it does give you the power to move pieces, and later on there is a purple piece that gives you the power to rotate them. As for the pieces not being movable when you stand on one, it is extremely necessary. For example, from the area with the three green pieces, you could reach any space on the map by continuously swapping pieces. Edit: I misunderstood the comment. 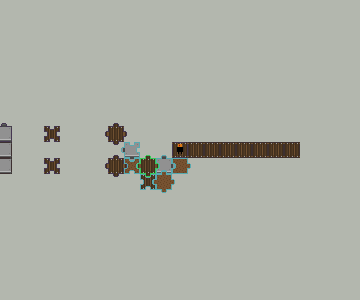 The first puzzle is solvable using only the pieces directly on the path, the second puzzle is supposed to use one from the first. 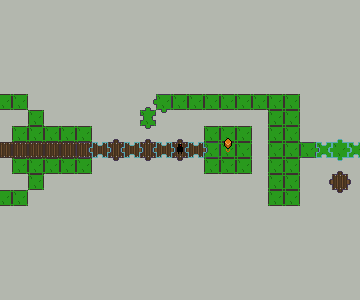 I added a gif of the first area below. Ah, I see. How do I rotate pieces? You can't until you get the purple piece, then it is with left and right, A and D, or Q and E.